PicsURL 1.6v, dynamic URL picture displayer. What is picsurl? Picsurl is dynamical webpage generator, which was made to display pictures from given address in a html-page. The page is generated dynamically, i.e. on the fly. You can download all full size pictures from any page by adding "&showall=1&nothumbs=1" in the end of the page address, e.g. like this. No separate zip file etc. needed for full download. Pictures stay under your control. They are not uploaded to a third party site with complicated copyrights. You need to only upload your pictures to a browsable directory and you can send the link (no user accounts, extra software, etc.). You can save the picsurl page to your picture directory and customize it for your purpose. Picsurl page is dynamic. Just delete a file and it is not in the picture list. How does it work? Picsurl needs only URL, webpage address, that is browsable. It searches all links from the page that contains pictures and links them into one page. How can I get all pictures from a picsurl-page with full resolution? You can download all full size pictures from any page by adding "&showall=1&nothumbs=1" in the end of the page address, e.g. like this. Then just take "save as" with your browser and the browser saves all the pictures (and the picsurl page) to the directory you chose. If you have tens of pictures you might want to press stop before all of the pictures have been loaded to the web page in order not to jam your browser. When taking "save as" the browser will in any case download the full pictures (not just save the ones already downloaded for display). No separate zip file etc. needed for full download. How to use thumbnails? The picsurl searches for "thumbs"-folder, if it is found, then it links all the images found into thumbs directory. The images in thumbs directory have to be named identically with the original pictures. In linux: Install ImageMagick and use convert command. You can use for example this script to generate thumbnails from all JPGs: picsurl_thumbs_script.sh. In windows: Install Irfanview and use patch mode to resize wanted images into smaller. What means "make shortcut public"? It will be listed on the example page (latest and most popular public shortcuts). Then create a new page using picsurl.com like you normally would. The page you created works with other browsers except with Chrome. Can I add description in the start of the page? Yes, add text file named description.txt in the same directory where your pictures are. Then write the description you want inside <description></description> tags. Here is a simple example of such description.txt. Can I refer to a certain picture in a page? Yes, use the picture name as achor tag. For example http://picsurl.com/?id=headstand#Mexico-Teotihuacan. 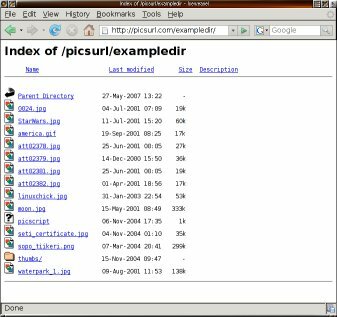 PicsURL 1.6v (w3c valid) 2002-2019, (C) picsurl.com.